What are the main predictors of Post-Operatory Complications after Radical Cystectomy and Urinary Diversion? Introduction and Objective: Radical cystectomy is a complex procedure with high risk of postoperative complications. The aim of our work is to analyse the effect of preoperative clinical variables and comorbidity on 30 and 90-day, as well as hospital re-admissions, after radical cystectomy, in one centre. 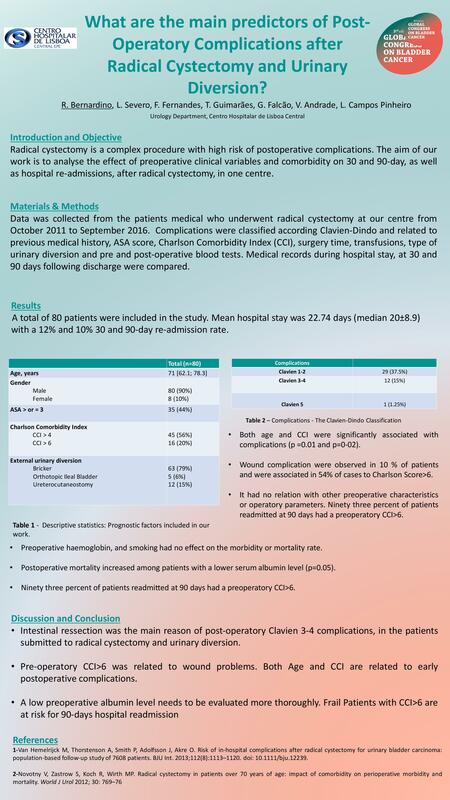 Materials & Methods: Data was collected from the patients medical who underwent radical cystectomy at our centrel from October 2011 to September 2016. Complications were classified according Clavien-Dindo and related to previous medical history, ASA score, Charlson Comorbidity Index (CCI), surgery time, transfusions, type of urinary diversion and pre and post-operative blood tests. Medical records during hospital stay, at 30 and 90 days following discharge were compared. Results: A total of 80 patients were included in the study. The medium age was 71 years [62.1;78.3]. Ninety percent of our population was male. ASA score was 3 or more in 44% of patients. Median CCI was 5, with 56% of Patients having CCI>4 and 20% >6. Seventy-nine percent of patients received an external urinary diversion bricker, 6% an orthotopic ileal bladder and 15% an jureterocutaneostomy. Mean hospital stay was 22.74 days (median 20±8.9) with a 12% and 10% 30 and 90-day re-admission rate. We observed 29 complications Clavien 1-2 (37.5%) and 12 (15%) Clavien 3-4 with 1 Clavien 5 (1.25%). Clavien 3-4 was relate to ileus resection for urinary diversion. Preoperative haemoglobin, and smoking had no effect on the morbidity or mortality rate. Both age and CCI were significantly associated with complications (p =0.01 and p=0-02). Postoperative mortality increased among patients with a lower serum albumin level (p=0.05). Wound complication were observed in 10 % of patients and were associated in 54% of cases to Charlson Score>6. It had no relation with other preoperative characteristics or operatory parameters. Ninety three percent of patients readmitted at 90 days had a preoperatory CCI>6. Conclusion: Intestinal resection was the main reason of post-operatory Clavien 3-4 complications, in the patients submitted to radical cystectomy and urinary diversion. Pre-operatory CCI>6 was related to wound problems. Both Age and CCI are related to early postoperative complications. A low preoperative albumin level needs to be evaluated more thoroughly. Frail Patients with CCI>6 are at risk for 90-days hospital readmission.